Is your product enjoyable for your users? The project is dedicated to support the elderly population and therefore includes the research and development of highly cognitive brain fitness content. The innovative in the technology parts; such as new methods of UI, usage of UFD and content authoring tool are required to support the main objective of providing ICT to the elderly population. Those technological goals may also fit the general population needs in advances UI in front of the iDTV, usage of UFD with STB and authoring tools for iDTV content creation and therefore may be considered as beneficial results of the projects. The scope of i2home is the Intuitive Interaction for Everyone with Home Appliances based on Industry Standards. In this way i2home will make devices and appliances at home more accessible to persons with mild cognitive disabilities and older persons. In our usability lab we have designed graphical user interfaces and tested their ergonomic and cognitive suitability for home environment. The project is in progress. The vision of Enhanced Learning Unlimited (ELU) project is to increase learning opportunities at home, office and school via interactive digital TV (iDTV). In our usability lab we have designed and tested iDTV learning courses for elderly users. The key issue is graphical interaction in rich multimedia environment. The project is in progress. The aim of the project was to research and develop means to improve the efficiency of mobile business processes through mobile, personalised knowledge management. In our usability lab we developed and tested sophisticated graphical user interfaces for manipulation of complex graphical data on mobile devices. The project has finished. 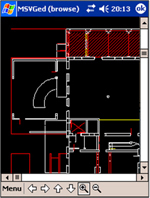 Goal of this project was design and development of graphical editor on PDA that supports simultaneous collaborative work with shared document. This editor was part of the more extensive infrastructure of collaborative environment. Usability testing was highly involved during the development. We executed standard usability tests and we also experimented with collaborative usability tests. We found lot of issues, namely navigation in the shared document and work in collaborative environment. We have performed usability tests of NetBeans IDE with respect to its usage by visualy impaired users. We have also tested the usability of NetBeans IDE to generate accessible GUI components. Based on those tests we have designed and developed accessibility plugin. Goal of this project is develop better tools for evaluation of A11Y rules in Java application. The tool will be integrated into NetBeans IDE. We will focus on rules that work with Label For parameter, Tooltip parameter and Mnemonics parameter. Good tab traversal, or tab traversal in general, is usually one of the most omitted accessibility components. 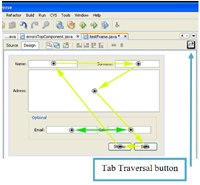 Traversing components by tabulator on the keyboard, or control-tabulator shortcut for traversing where tab is accepted by the component itself, is not only a fast way to move through the whole form, but it is a necessity for an application which hopes for good A11Y. Goal of this project is to develop plug-in that will make it possible for programmers in NetBeans IDE to visually design focusTraversalPolicy class for the container and have it automatically generated into the source code. This is done in a separate window of a focusTraversalPolicy property editor where the currently selected container is replicated and prepared for design. 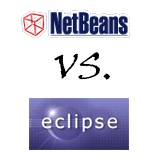 Goal of our study was to compare some characteristics of two IDEs NetBeans and Eclipse. We ran comparative study of out of box user experience. Our study investigated 45 minutes of the first contact with the IDE. For the test we used Eclipse 3.1M6 and NetBeans 4.1 BETA. Goal of this test was to compare out of box experience of Solaris OS on several HW platforms and Linux. The study investigated 1h 30 minutes of the first contact with the OS, including download, instalation and first usage. Students of the Department of Computer Science and Engineering work on projects, that were supervised by the Voice Technologies and Systems Division of IBM Czech Republic. The projects were mainly focused on the use of the speech recognition and synthesis in the context of intelligent office and car environments. Example of test setup during Car Dialer usability tests. The objective of this test was to investigate increases of car driver load during using Car Dialer, a multimodal application developed by IBM, in real traffic and analyze influence of this load to driving safety. 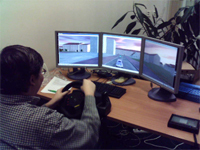 Driving condition and user load was simulated by the City Rider, a car simulator application developed as a student project. The content of the project was the expert inspection of control panel for motor diagnostics. Result of the inspection was redesign of the control panel.